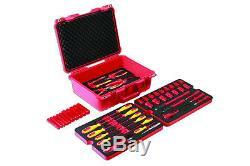 Allen Hex Torx Key Sets. 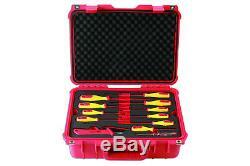 50pce 1000v Certified Hybrid Electric Vehicle Technician Tool Kit in Case. 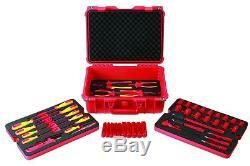 Ideal for use on Hybrid and Electric vehicles and professional electricians. 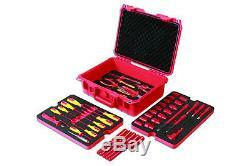 50 Essential tools with 1000v Certification in robust 3 tiered case. 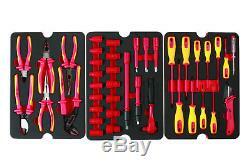 11pc Screwdriver Set: T30x150mm, T25x125mm, T20x100mm, Flat 4mmx100mm, Flat 3.5mmx100mm, Flat 3mm x 100mm, Flat 2.5mmx75mm Circuit Tester , Ph2x150mm, Ph2x100mm, Ph1x80mm. 16pc 3/8"D Socket Set: 6mm, 7mm, 8mm, 9mm, 10mm, 11mm, 12mm, 13mm, 14mm, 15mm, 16mm, 17mm, 18mm, 19mm, 20mm, 22mm plus 2pc Extension bar 250mm, 150mm, 3/8"D Ratchet and 3 Spline Bits M8, M10, M12. 6pc Plier set including Cable Shears, Bent Nose Plier, Long Nose Plier, Flat Nose Plier, Side Cutter and Water Pump Pliers plus 1 x Insulated Ratchet and 2 x Extension Bars. Plus 10 Protective 100mm Sleeves: 5 x 18mm and 5 x 24mm and 1 x insulated cable stripping tool. 50 Years+ experience of repairing vehicles we feel well qualified to trade within the automotive sector as a supplier of tools & equipment. This is where our business has the advantage over our competitors, we carry a large stock for immediate supply or the promise that non stock items can be dispatched within 48hrs. With having our own up to date workshops we have a wealth of experience & skill to advise on any questions we are asked , from technical data to how the items works. If we cannot answer the query we have many contacts and our 50 years experience in the business to find out the correct answers for you. We always aim to deliver to you efficiently and cheaply, We will dispatch items within 24/48 working hours of the order being processed. Our acceptance of your order brings into existence a legally binding contract between us. Price 2.1 The prices payable for goods that you order are as set out in our website.